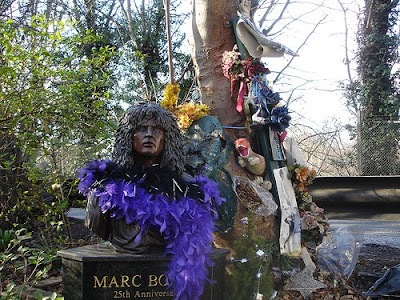 Former T-Rex frontman and all round rock legend Mark Bolan died on 16 September 1977 when a Mini driven by American singer songwriter Gloria Jones had problems negotiating a humpback bridge near Gipsy Lane on Queens Ride, Barnes. Bolan was in the passenger seat and when the Mini hit a sycamore tree he died instantly. The site has been a site of pilgrimage for Bolan fans ever since and, in 1999 the T-Rex Action Group was formed, undertaking the formal maintenance of the site.